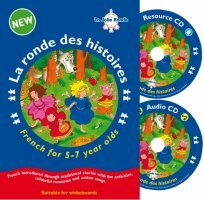 A new resource for 5 to 7 years olds to introduce them to French through four traditional stories, that come to life with fun activities, colourful resources and action songs. Resources CD - with an extensive range of materials including coloured flash cards, finger templates for each of the characters, text cards and mask templates. They can be printed or used on a computer or an interactive whiteboard. This pack is great for use with Key Stage One and lower Key Stage Two classes (ages 5 - 7).